If you ask us, there’s no more important place for building a strong future than in local schools. That’s why we work hard to support local education and to help teach students about safety around electricity. We blend elements of the Texas Education Agency (TEA) state test and the Texas Essential Knowledge and Skills test into all GVEC education programs, too. This allows teachers to integrate our presentations into the curriculum in a way that complements and enhances state standards and requirements for student learning. 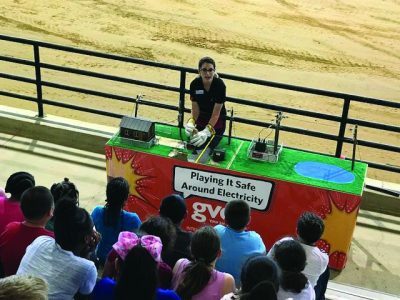 While students are learning about safety around electricity through GVEC education programs, then, they’re also adding to a solid, state-approved foundation for future academic success. 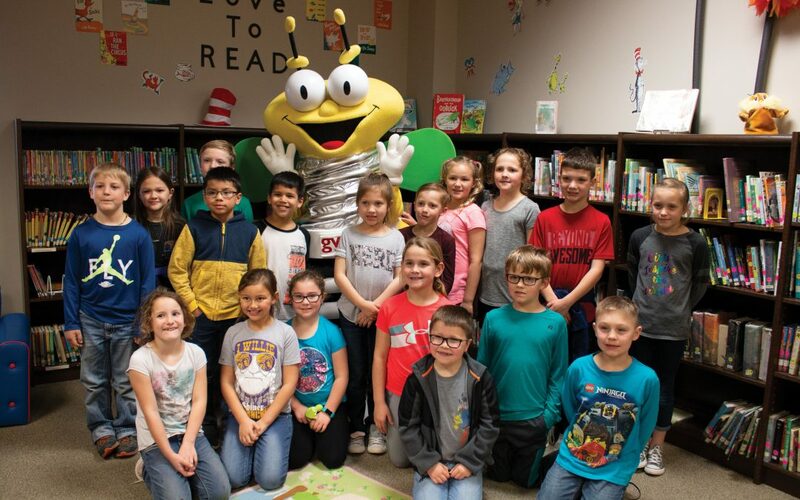 GVEC’s Louie the Lightning Bug Electrical Safety Program and Coloring Contest might be considered the starting point for all other GVEC education programs. In 2020, Louie will celebrate his 35th year visiting elementary schools within GVEC’s service territory. From January to February, Louie delivers a fun, hands-on education presentation about safety around electricity to over 3,000 second grade students. The big, yellow mascot visits each participating school in person. His presentation includes a video with an animated Louie the Lightning Bug singing, dancing and rhyming his way through rules and reminders about electrical safety. For all his rollicking, frolicking and singing on video, however, Louie is the lovable but silent type in person and does his talking with prizes! Each year, he delivers glow-in-the-dark t-shirts, wristwatches and GVEC lunch boxes to the lucky winners of his annual electrical safety coloring contest. Every year, students from grades 6 through 12 take a trip to GVEC PowerTown through this engaging, “energetic” display. Upon request, we also present GVEC PowerTown to 4th and 5th grade students and even to some adult audiences. This live demonstration uses a miniature town and real electrical voltage to illustrate the possible hazards of power lines. Presenters generate power arcs, along with popping and buzzing noises, and show what happens when a kite or tree limbs come in contact with overhead lines. GVEC PowerTown are also includes displays of power lines falling on a car, the consequences of making contact with padmount transformers (big green boxes) and what happens when a pole transformer falls on a home service line. The GVEC Summer Reading Program is multifaceted and designed to educate and keep youngsters engaged during summer downtime. Each summer, our Community Relations department coordinates with public libraries throughout the territory to read a preselected book on safety around electricity to groups of elementary age students. Community Relations Representative Kasie Tankersley says, “Each GVEC Summer Reading Program looks a little different, depending on everybody’s schedule. 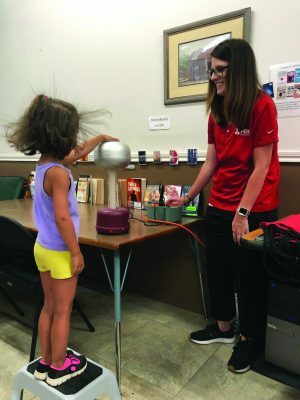 Sometimes we incorporate a GVEC bucket truck and even include a PowerTown demonstration.” The most popular element of the GVEC Summer Reading Program, Tankersley added, might be the miniaturized Van de Graaff generator, which creates a slight static-electricity charge and causes participants’ hair to stand on end when touched. “Kids love it,” Tankersley added. GVEC maintains a permanent booth at this yearly, three-week fall event, which is designed to immerse students throughout the region in the study of agriculture. GVEC’s Red Barn booth includes a timeline of electricity usage in the Guadalupe Valley and a history of GVEC up to the present. There’s also a presentation of different forms of electricity, along with a demonstration of home electrical devices and the path electricity takes to reach the home. “We also talk about how electricity impacts agriculture,” Tankersley explained. She added that one of the booth’s most popular features is a stationary bike that allows students to generate live electricity by simply pedaling. GVEC is proud to promote higher education in the Guadalupe Valley through the GVEC high school scholarships. These awards aid students in a complete range of study disciplines, including in trade and vocational fields. We typically award 15 GVEC high school scholarships every year, worth $2,500 each. Some years, however, the field of exceptional talent exceeds 15, and the Cooperative awards a greater number. 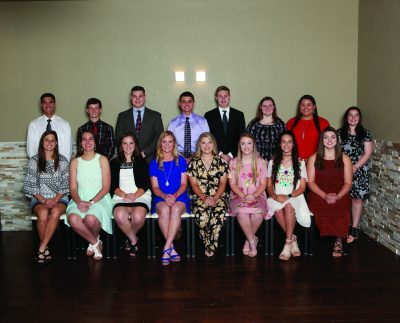 In 2018, for instance, 17 area students received GVEC high school scholarships. There are no limits on field of study. These scholarships can be used for a four-year university, a two-year college or even for a trade school. To learn more about GVEC education programs or to inquire about scheduling a presentation at your organization, visit gvec.org or call us at 830.699.4832.